April and May has been a very hectic time for me. If you follow me on Instagram or Facebook, you'd know that we're doing bathroom renovations. They've been a total nightmare and I've been living between 2 houses which are about an hour away from each other, so I feel like I've spent a huge amount of time sitting in a car for the last 2 months. Because I've been going back and forth and I've had to live out of a suitcase, I've been using mostly the same products. I tried to mix it up when I would return home and pack some new and different products, but 80% of the time I would use the same products daily. One of the most exciting things that I trialed was the Irresistible Me Ruby Auto Rotating Curler. * I've never used a rotating curler before and was really curious to see how I would go with it. I'm a bit uncoordinated, so I was half expecting that I would get my hair caught in it!! Surprisingly, I found this 1000 times easier to use than a normal wand. Because it does the curling itself, it halves the time that it used to take me to curl my hair. 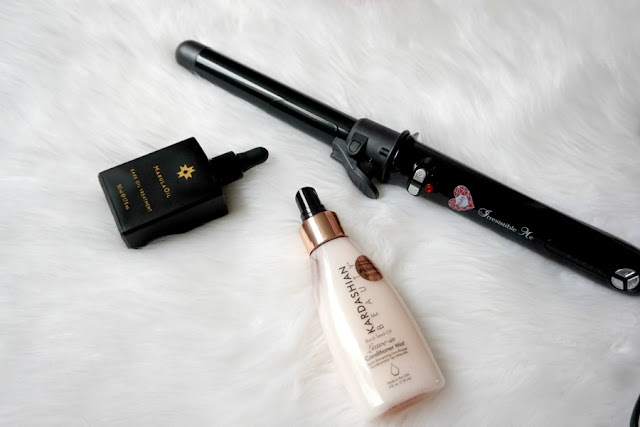 Because my hair is quite long now, I wasn't sure if I would be able to curl my hair in one go but I've actually found that the Ruby curler made it even easier. The curler spins fast enough to make curling my hair quicker but not too fast that I end up with my hair in a mess. When I use this it gives me curls that last for days. You can see their other hair tools here. I picked up the Kardashian Beauty Black Seed Oil Leave In Conditioner Mist while staying with my parents because I forgot to pack one. And I'm so glad that I did because it's incredible!!! It leaves my hair so soft and silky. It also has a gorgeous smell too. The Paul Mitchell Marula Oil Rare Oil Treatment* smells and feels as luxe as it looks. It has a dropper, so it makes it easy to dispense. They also have a lighter version which I've already finished. I used the light version for daily use and this version I liked to either add to my conditioner to turn it into a hydrating mask or I applied a few drops to my dry hair half an hour before washing it. I'm obsessed with the Goodness Natural Beauty Lab Certified Organic Chia Seed Oil. * It sinks into my skin easily and quickly. I used it as a typical serum for daily use as well as applying it before applying a detoxifying mask. I picked up this tip when I had a facial at the Burnside Jurlique spa. I've found by using an oil first (just a drop or two) and leaving it for a minute it has meant that I can use masks that previously made my skin feel too tight or dry. The oil helps to protect my skin and add in moisture while the detox mask helps to rid congestion. I'd recommend the Jurlique Signature Facial* especially now as we're going into winter. I've noticed that my skin has changed since I last went for a facial so I'm hoping to get another treatment soon. I'm critical of my skin, but a beauty therapist can look at it impartially. I'm hoping that they can help, as at the moment my cream cleanser feels too oily on my skin but my gel cleanser feels too harsh and drying. Hopefully by going to a beauty therapist they can help me understand my skin more. I was so glad that Lush brought back their Lush Yummy Mummy Shower Cream* for Mother's Day as it's one of my favourite scents from Lush. The shower creams feel more hydrating on my skin, so it's perfect for the colder weather. I just wish that they had also released the body conditioner in the Yummy Mummy scent this year. I ended up using all of the exfoliator that I packed so I picked up the ModelCo Exfoliating Facial Scrub as it was on sale and I already had a scrub at home so I didn't want to spend a lot on another one. But this is so amazing that I could use this for the rest of my life!! It's creamy and has the perfect amount of grit. It's gone onto my holy grail list! The Oh Deer Sugar (Oh) Gingerbread Body Scrub was a Christmas edition scrub that I picked up. It's amazing. Not only does it smell incredible, but it's a gorgeous scrub that helps to exfoliate my skin. I really love to use it at night if I've been on my feet all day. Oh Deer Sugar is an Adelaide based company, so if you live in Adelaide check out their store. I can guarentee you won't leave empty handed! I picked up a few of the Lanolips 101 Ointment in "Cranberry" when they were half price after Christmas and I've nearly finished the 3 that I bought. I adore Lanolips and need to pick up more when I go to Priceline next. The Elucent Whitening Day Moisturiser* was a product that I fell in love with after the first use. This was in one of the Bloggers United AU gift bags and I've been converted for life!! While it's a great moisturiser it also has SPF 30. I currently use a Clinique sunscreen that I like but the only downside is it's SPF25, so I adored using this with it so I know that I have enough sun protection. I just finished this so I need to get to Chemist Warehouse asap to get another one. 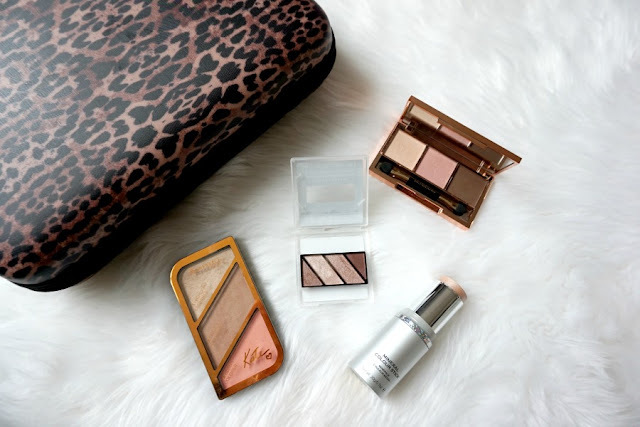 The Rimmel Kate Sculpting Palette in "Coral Glow" was the perfect product to take in my make up bag. Because it has a highlight, contour and blush in it, it meant that I could just pack this and know that I didn't need anything else. Another product that I loved using was the Mary Kay Mineral Eye Color Quad in Sandstorm. * It's a great netutral quad for everyday use. The shadows are really creamy and the colours look so gorgeous. I want to try out more of these as I've adored using Sandstorm. I've fallen back in love with cream highlighters and the Vani-T Mineral Colour Stick in "Ivory"* has to be in my top 3! It's a shimmery pale colour that gives me such a gorgeous glow. The stick formula is perfect for travelling and it's so easy to use. My Dr Hauschka Eyeshadow Trio Palette* was one of my very favourite products over the last 2 months. Firstly the packaging is so luxe. The rose gold packaging is so stunning. The formula of the eyeshadows is beautiful and creamy. Even though there's only 3 colours they work so effortlessly together. This has been the first Dr Hauschka make up product that I've tried and it's gotten me excited to try out other products in the range. I now want to try out their Rouge Powder Duo and their Balancing Teint Powder. I bought my David Jones Cosmetics Case about a year and a half ago and it's been a lifesaver over the last few weeks. It's quite similar to this one from Laura Mercier as it's a hard case make up case with removable storage. I've really liked having all of my products there in front of me so I'll continue to use this even though I'm not travelling anymore. The Manicare x Liz Kelsh* brushes are a fantastic collaboration that was recently released. Manicare wanted to give a make over to their brushes and they teamed up with make up artist Liz Kelsh to release a collection of 10 brushes that are affordable and easy to use. I've really been adoring the Stippling Brush, Foundation Brush, Smudge Brush, Blending Eye Brush and the Contouring Eyeshadow Brush. All of the brushes are under $20 so they're so affordable. I have a review going up soon with a more indepth review of each brush. Chi Chi have also revamped their brushes and released a whole new range too. The ChiChi Cosmetics Large Powder Brush is my favourite brush out of the range. It's so large and fluffy. I've been adoring this for applying mineral foundation powder. It makes it so quick and easy to apply. 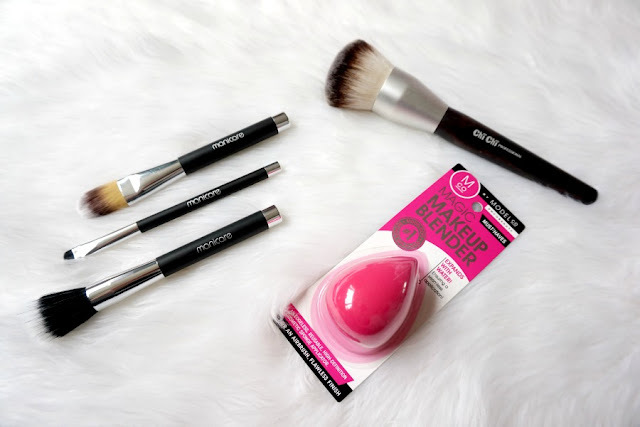 The first time that I used the ModelCo Magic Make Up Blender, I was really intrigued as it's unlike other sponges that I've used. It's quite heavy and reminds me of a stress ball. While it has an unusual texture, I've found that it gives me a flawless base. I'd recommend picking up one to try out yourself as it's very different to the other sponges out there. 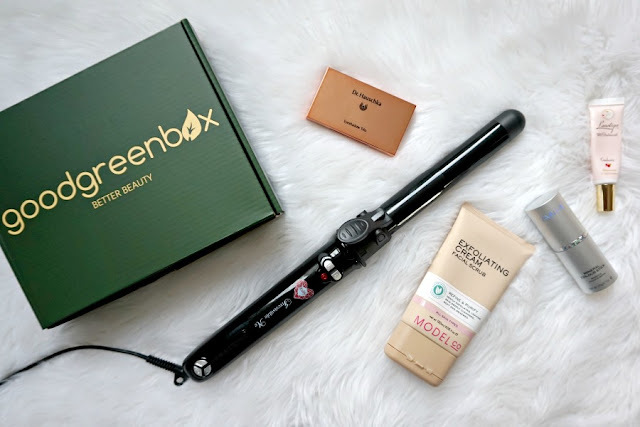 Good Green Box* is a newly launched subscription box full of natural, organic, vegan or cruelty free beauty products. 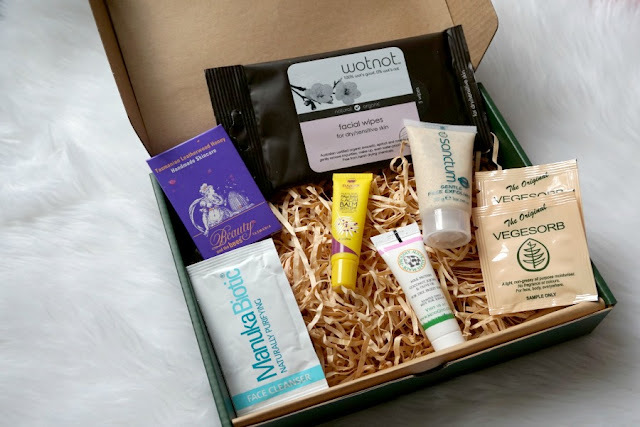 The first box (above) included skincare from brands like Wotnot, MooGoo and Suvana. I really enjoyed this box as it introduced me to new natural brands that I hadn't heard of before. If you're interested in finding out about new brands and natural products then this is the box you should sign up for. It's $25 per month and is delivered to your door. I can't wait to find out what will be in the next box! You can find out more about them here. OMG!!! 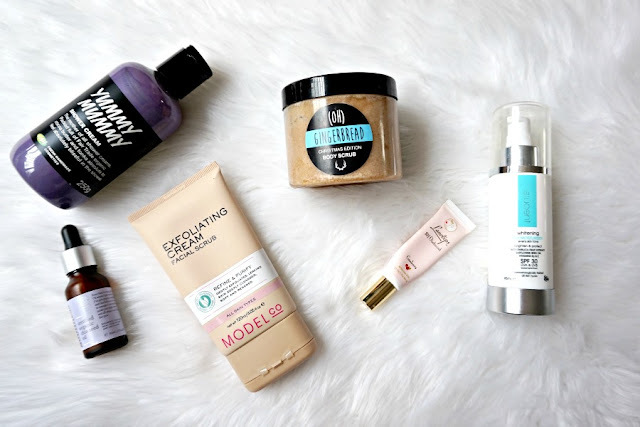 So many great products I see in here!!! I want to try them all for they seem worth it. No wonder why they are your favorites!